It then goes to the MSC (Mobile Switching Centre) which authenticates, validates, and locates the subscriber. It checks the HLR (Home Location Register) which is the database of the customer’s SIM services (i.e. SMS, Voicemail, Long distance, Call display, etc.). Once it confirms the subscriber services, it goes back to the handset the same way, but all these happen so fast that it becomes seamless to the subscriber. Another component in the network is the GMSC (Gateway Mobile Switching Centre) which routes calls targeted to another carrier’s wireless network or the PSTN (Public Switch Telephone Network). There is also a VLR (Visitor Location Register) which is used for load balancing as it stores subsets of information from the HLR when the subscriber is not in his home area. When roaming, there also is the EIR (Equipment Identity Register) which is a database of all blacklisted equipment (though this one is rarely used these days already). There is also the AuC (Authentication Centre) which stores the private key for SIM authentication. Both of these are connected to the MSC. For data services, a.k.a. 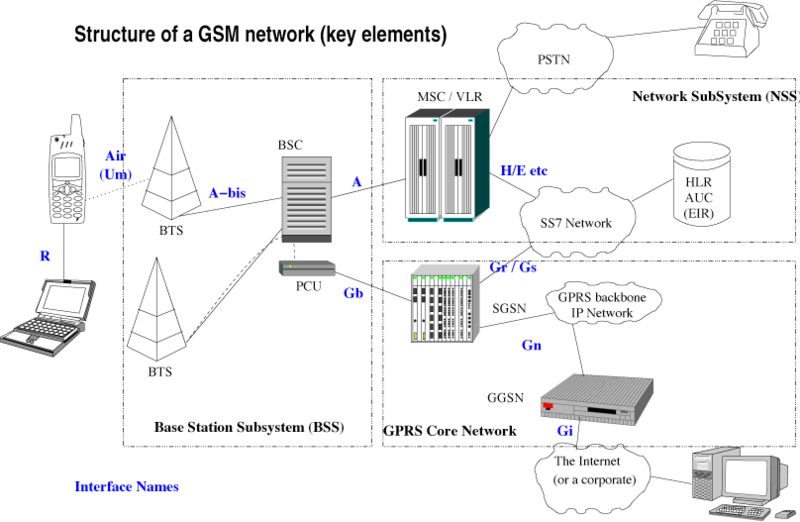 GPRS (General Packet Radio Service), the SGSN (Serving GPRS Support Node) acts as the MSC. It then goes to the GGSN (Gateway GPRS Support Node), then depending on the APN (Access Point Name), it will go out to the Internet in varied ways. There are three APNs commonly used. Goam.com, which is used for plain text browsing, accesses the Internet via a WAP Gateway. Internet.com, which is used for HTML browsing, accesses the Internet via a NAT Server. Thirdly, Media.com, which is used for multimedia messaging, accesses the Internet through a WAP Gateway, then a MMSC (Multimedia Service Centre) or SMTP server (for email). These are all the network components in the GSM network which are nice to know especially if you work in the telecommunications industry. This entry was posted in Tech, Wireless. July 28th, 2008 questions and answers in my Advanced RF/Wireless Techniques class. SFN, or Single Frequency Network, is a broadcast network where several transmitters simultaneously send the same signal over the same frequency channel. 2. Why does OFDM enable SFN technique? OFDM, or Orthogonal Frequency Division Multiplexing, which is used in wideband digital broadcasting, enables SFN technique in order to have efficient utilization of the radio spectrum, allowing a higher number of radio and TV programs in comparison to traditional multi-frequency network (MFN) transmission. An SFN may also increase the coverage area and decrease the outage probability in comparison to an MFN, since the total received signal strength may increase to positions midway between the transmitters. SFN considerably improves the utilization of frequency bands and channels as well as energy balance of digital transmitters. 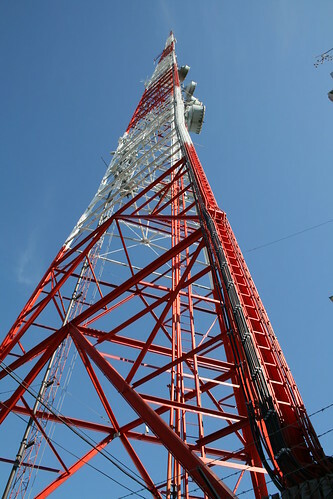 The signal coverage of a certain area can be provided by a number of transmitters, transmitting the multiplex of digital television or radio signals in the identical frequency channel. 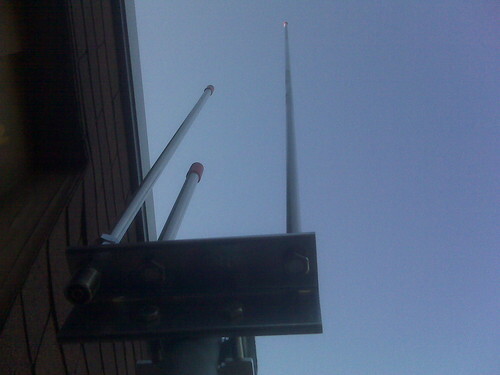 Their partial signal contributions in the reception point not only do not interfere, under certain circumstances then even improve the reception. 3. What are the benefits of broadcasting using SFN? This is definitely just a random post. This entry was posted in Education, Tech, Wireless. When you want a powerful PC, one that is able to do multiple heavy tasks, it is probably a good idea if you custom build your own, since you could make it more powerful and at the same time cheaper than those ready-to-use PCs. Okay, I understand that not all people are that tech-savvy to be building their own PC, but if you somehow like taking risks, maybe you could try doing it, but of course it would help if you had a tech-savvy friend around. And of course, monitor(s), keyboard, and optical mouse are additional things you must have. Be sure your monitors have DVI input. I liked having to use two 24-inch monitors. If you have to use two monitors, you would also need to install the correct drivers so you would be able to use the two as one big screen, and not two separate screens. Now if for some reason you needed to have two PCs, you would also need a KVM (Keyboard/Video/Mouse) switch, plus additional cables. This would allow you to switch from one PC to another and view it on the same two screens. There are resources on the internet which you could utilize as you build your own PC, so refer to them if you ever decide to build one of your own. Too good to be true, eh? 🙂 Turns out, it’s only like a promo thing for Nova Scotia [read: non-existent] which you’ll realize when you click on the Release Date link. Very creative, I must say! This entry was posted in Gadgets, Tech and tagged Phones.